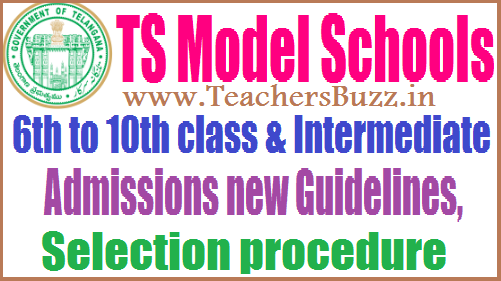 TS Model Schools 6th to 10th class and Intermediate Admissions new Guidelines, Selection procedure. TS Model Schools Class wise strength Increased - New Guidelines, Selection procedure for Admission of students into Telangana Model Schools. TS Model Schools 6th to 10th class and Intermediate Admissions new Guidelines, Selection procedure. Telangana State Government decided to increase the intake of seats in Model Schools from Class VI to X for each Class from 80 to 100, hence increasing the total intake of students from 400 to 500 and to increase the intake of seats in Intermediate I & II year from 20 to 40, hence increasing the total intake of students from 80 to 160. The existing 10th Class Students who have acquired or passed SSC Examination from the Model Schools in the State shall be considered for admission into the Intermediate First year in the same Model School. 1. G.O.Ms.No.17, Education (SE-Prog.I) Department. Dated 11.02.2013. 2. G.O.Ms. No.8, School Education Prog.I) Dept., dated 01.06.2015. 3. G.O.Ms.No.10, Education (SE-Prog.II) Department. Dated 09.06.2015. 4. From the DSE & EOPD, RMSA/Model Schools, Telangana, Hyd, Lr.No.550/B1/MS/TS/2013, dt: 25.02.2016, 19.03.2016, 05.05.2016 and 04.06.2016. 1. In the G.O. 1st read above, Government issued Guidelines and procedure for admission of students into Model Schools in the State of Andhra Pradesh from the Academic Year 2013-14. 2. In the reference 2nd read above, Government have declared the Telangana State Model Schools as Specified Category Schools under Right of Children to Free and Compulsory Education Act, 2009. 3. In the reference 3rd read above, Government have issued modification orders to the G.O. 1st read above, changing the admission pattern in Model Schools in the State of Telangana. 4. In the reference 4th read above, Director of School Education & EOPD, RMSA/Model Schools, Telangana, Hyderabad has requested the Government to increase the intake of seats in Model Schools from Class VI to X for each Class from 80 to 100, hence increasing the total intake of students from 400 to 500 and to increase the intake of seats in Intermediate I & II year from 20 to 40, hence increasing the total intake of students from 80 to 160, to consider the existing 10th class students who have Acquired or Passed SSC Examination from Model Schools in the State for admission into the Intermediate First year in the same Model Schools without referring to the Procedure for Admission stipulated in the 1st read above, so as to enable the Model School students to continue in the same school and also to withdraw the provision for selection of the Students into Model Schools by the District Level Committee. Instead of the District Committee, he has proposed the system of Centralized admissions etc. Note: 1)The admissions for Classes VI to X shall be done by conducting written test and admissions into Junior College Intermediate 1st year shall be based on the marks got in the S.S.C. Examination. 2. The reservations shall be adopted for admission of students into the Model Schools as detailed below after examining the reservations pattern of APREIS, APSWEREIS, APTWREIS and KV/ Navodaya Vidyalaya duly keeping in view the constitutional provision of reservations. 1. The DSE Telangana, Hyd and Ex- Officio Project Director (EOPD), RMSA/ Model Schools shall issue a Notification inviting online applications for admission into Model Schools for Classes VI to X and First Year Intermediate. 2. In the Notification, the Director of School Education & E.O. PD., Model Schools shall mention the syllabi for the Written Test, the Examination Centres for the Written Test i.e., the Model School concerned which the Student has applied for and also the Schedule of the receipt of Online Applications, Conducting of Written Test, Valuation and Preparation of Selection Lists etc., till completion of the Admissions. 3. The receipt of Online Applications, the Valuation of the Written Test Answers Sheets will be done at the State Level. 4. Based on the Valuation, the Selection List for each School will be prepared at the State Level and made available online and informed to the Principal of the School concerned with copy to the DEO/MEO concerned. 5. A News item shall be released by the DEO for the benefit of the public and to help the selected Students to approach the School concerned for joining. 6. Based on the Selection List, Admissions will be made in each Model School. Admission into Intermediate I Year shall be based on the marks secured in the qualifying examination i.e., SSC or its equivalent. 7. The existing 10th Class Students who have acquired or passed SSC Examination from the Model Schools in the State shall be considered for admission into the Intermediate First year in the same Model School. b) The EOPD, RMSA/ Model Schools can allot 2% of the seats per Class of 100 Students for VI to X Classes and 160 Students for Intermediate and not exceeding 10 per School over and above the sanctioned strength, to the children of the regular Employees of the Model Schools. These Students will enjoy the benefit of School study only, without any other benefits as extended by the Government to the other Students i.e., free Text Books, etc. c) While preparing Selection Lists, a Waiting List of 20% of the seats also shall be prepared at the State level and Students will be admitted in the order from the Waiting List for the left over vacancies in the Model School concerned. d) The left over vacancies of any Class in a Model School will be allotted at the State level, to the Students from other Mandals, only after exhausting the list of Students of that particular Mandal, to ensure optimization. e) The Principal of the Model School concerned shall take steps to admit selected Students duly verifying the Certificates and maintain Admission and Withdrawal Register for the School. f) In case of any dispute in admissions, the decision of the Director of School Education & E.O.P.D., Model Schools shall be final. 6. This Order shall come into force with immediate effect. The Director of School Education and Ex-Officio Project Director, RMSA/Model Schools, Telangana, Hyderabad shall take necessary action in the matter, accordingly. #TS Model Schools Admissions new Guidelines, Selection procedure.